As a Master Locksmith burglary repairs in London are something I deal with regularly. It is always a real shock to be met with the devastation of a burglary whether it is at your home or your business premises. It can be such a shock to the system that it can send many people into a panic and some are at a loss of what to do after a burglary. I have noticed a need for a quick reference burglary tips guide to use in an emergency break in situation. So I have come up with an easy reference burglary what to do checklist. If you arrive home and recognise signs of intruder access take care to ensure that the intruder has already left the property. Burglary is classed as a non-emergency call unless the crime is actually in progress. In the case that you catch a burglar in the act then you should call 999. There are other police numbers you may wish to note here such as a text phone number for those with hearing or speech difficulties and a number to use if you need to contact the police from abroad. Take advice from the police as to whether you should leave the items in your home untouched until they have the opportunity to assess the situation. At this point you may wish to call a friend, neighbour or family member for emotional support. Discovering that you security has been breached can be very upsetting and it is important to take care of your needs at this time. IKS are a North London based home security specialist locksmith providing a 24/7 service. a) Make sure that your property is secure as a priority. Make sure that you call a reputable locksmith – the industry is unregulated. Choosing an MLA approved locksmith guarantees that the locksmith is CRB checked and qualified. b) Ask for a quote to make emergency window or door repairs as required. BEWARE: Burglary repairs in London can be expensive and there are some companies who sadly take advantage of people in emergency break in situations! Make sure you ask for a FIXED PRICE QUOTE! The price quoted should not increase at the job! c) If keys have been stolen it is important to replace the locks to prevent a return visit from the intruder. d) It is advisable to discuss your home security with the locksmith to ensure that it is of a high standard. A good locksmith will advise you on the best security for your situation. You can read about how to upgrade your home security here. e) An experienced locksmith will also be able to tell you if the locks you have had on your property meet insurance requirements. You home contents policy will only pay out if there was insurance approved locks on your property. This is important information to have before calling your insurance company. With advice from the police assess the situation and work out what exactly has been taken. There may be sentimental items that are irreplaceable, high value items that can be replaced by your contents insurance or information sensitive items that are missing. Make a list so that you can decide what action needs to be taken for each missing item. 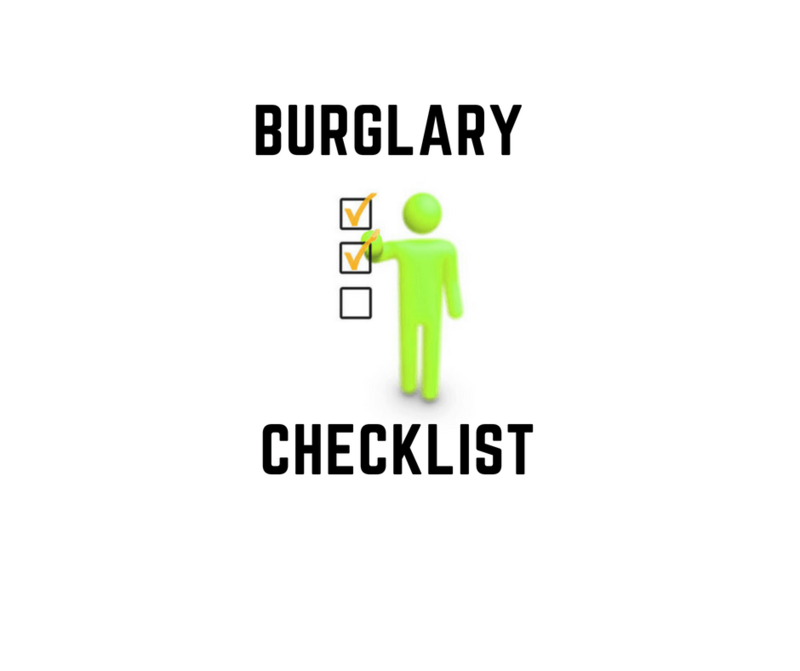 Ensure that the police have a copy of the list as there may be action that they need to take for specific items such as medication which could be a danger to children if the burglar was to discard it. A top priority is to notify your bank about anything connected to you bank accounts which has been stolen. It is vital to prevent access to you accounts without delay! The same applies to mobile phones – contact your provider as a priority and block the account. Let the police know if there is a tracking device on your phone. If car keys have been stolen inform your insurance company immediately and arrange for your car to be taken to a garage to have the keys reprogrammed. Documents with sensitive information should also be reported to the provider – for example passports, library cards, driving license and anything else that could be used. When contacting you contents insurance company ensure you have a crime number from the police. Also be prepared for questions about how the intruder accessed your property. This could mean the difference between the insurance paying out or not! Following a burglary there can be a great emotional impact on individuals and families. In particular the elderly and the very young. There are organisations that can offer support such as Victim Support. You can find further burglary advice information here on the police crime prevention website. You can also read out Ultimate Burglary Prevention Guide here. At IKS Locksmiths we are a Master Locksmiths Association Approved 24 hour emergency Locksmith based in Barnet, North London. We provide a high quality service at very competitive rates. Should you require a locksmith in London to carry out burglary repairs or to upgrade your home or business security to prevent burglary in the future call our Master Locksmith direct on 02032841045. We provide a comprehensive home security survey free of charge.